There are aliens that live among us, who came here to exterminate our species so they could take over our world. Did you know that? Now, they're not just coming because they're hostile creatures; they have a legitimate reason. A comet is barreling toward their planet, Hondo, and is threatening their livelihood. But then, something strange happened...they heard music. Music doesn't exist on Hondo, and instead of following through with his mission, General Trius becomes an earth-dweller and eventually creates a bluegrass band, Future Folk. Now how silly does that premise sound? I wasn't to keen once I heard the premise, plus having an alien band? Sounded gimmicky to me. However, about ten minutes in, the movie completely won me over. Music. It's a little aspect of our lives that we probably take for granted. What if we never had it and the first time we heard music was adulthood? When Trius (Nils Daulaire) first reaches Earth, he stumbles into a Sam's Club-type store and encounters music for the first time and becomes completely enamored. Even though he was sent to destroy the human race, how can he when they created something so amazing? Cut to ten years later where he has established a life for himself including a wife and a precocious little girl, and Hondo has sent another alien, Kevin (Jay Klaitz), to take out Prius because he never finished his of taking out the humans. But then, something happens to Kevin...he hears music! And thus their band is formed. The strongest part of the film is the middle act where Kevin and Trius really begin to bond. It begins with Kevin's first encounter of music, and his reaction to hearing Trius strum a banjo for the first time is quiet wonderful. His childlike excitement is palpable, and it makes you just giggle with endearment. Everyone has had that moment of discovery of something wonderful that changes their life: music, movies, playing a sport, cooking. When that something becomes so engrained, it's easy to forget the joy you feel at the beginning, just like we see with Kevin. Kevin quickly learns how to play the banjo and joins Trius in performing around the Brooklyn music scene. If anything, the film could have used more time with Kevin and Trius and their budding BFF-ness because after all, Kevin was on a mission to kill Prius. We get one montage and a really funny performance, but there needed to be more. Directors John Mitchell and Jeremy Kipp Walker make the most of what limited budget they have. The sci-fi elements end up being cheesy and somewhat cheap looking, but it adds to the charm of the film. Mitchell also wrote the film, and while it would have been easy to focus on the mission of the two Hondorians (Hondorlings? ), he decides to focus more on the relationships between everyone. Other than the friendship with Kevin, Trius has to deal with his wife. She's loyal and loving but now has a weird reality to face about the man she's been with for the past ten years. Does he tell her the truth about his past or should he keep her in the dark to protect her? There's in inner turmoil with Trius as he has been dragged back to his old mission of destroying Earth for his people. At 85 minutes long, FUTURE FOLK is quite short, but it was almost too short. If given another 15 or 20 mins, Walker and Mitchell could have explored these various relationships deeper and make the final act that much richer when it happens. Despite the shortness in length (which I seem to rarely complain about), FUTURE FOLK is quite a lovely film. The music is memorable and fun, and it will completely win you over with its charm and heart. Plus, this could easily be a film you could watch with children, if they're cool of course. You can check out Javi's review from this past Fantastic Fest here! 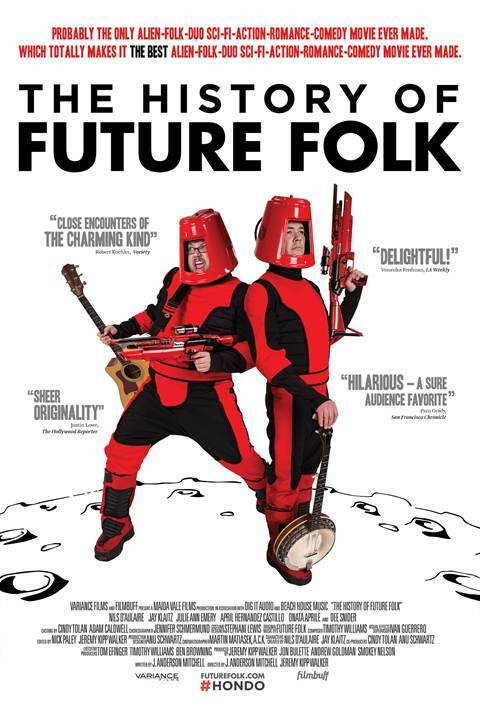 THE HISTORY OF FUTURE FOLK is now available on VOD.